We are proud to have those that serve or have served our country at High Adventure Ranch. Over the years, we have had many Active Military men and women & Veterans who have hunted with us. From Boars to Trophy Elk to 1400 pound Bison, these hunters have enjoyed their hunting times at the ranch. Our facilities are also equipped to accommodate individuals who have disabilities. 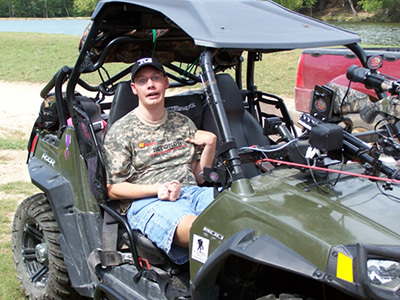 If a hunter needs any type of special needs on their hunt or back at camp, we can assist. Learn more about our modified facilities for handicapped or disabled persons. U.S. Army Sgt. Eric Edmundson in the Fall of 2011. We appreciate your loyalty and defending the great United States of America! To show our appreciation to all of you, we offer an active military or veteran discount. Contact us for details by clicking below.